Bad isn’t a bad word, but it’s a little bland and generic. Most of the time, there are better options. Below, I list 100 alternatives. Keep in mind, however, that not all are synonymous. Each has its own definition and connotations. You shouldn’t just plug any of them into any sentence you like. To make it easier, I’ve linked each word to its definition at Merriam-Webster.com. Check out the poster version. Feel free to pin and share. Hi i’m in 5th grade and i am doing a latin roots paper so i was wanting to know ways to say bad and i found your website thank you! Please excuse my ignorence, but could someone please tell me the different names for stories , also how many words make up the following : Novel, Novelett, Flash Fiction, epic. I know i have missed some, could you please help me with this? Splendid resources. I love this, tags and 250 went posts. Thank you! Is there a way to print just these posters? If I print this page it comes out over 14 pages! Would love to be able to print it as one page so I can stick it up on the wall! I’m working on it, Tracy. 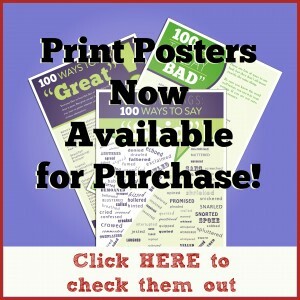 Hey Tracy, posters are now available at http://posters.writeathome.com! Love these ways-to-say posters! Thank you!